Expats and frequent movers life-style. People are moving, people are constantly moving somewhere in Europe… but where? Let’s see together some of the report’s data through these 4 maps. 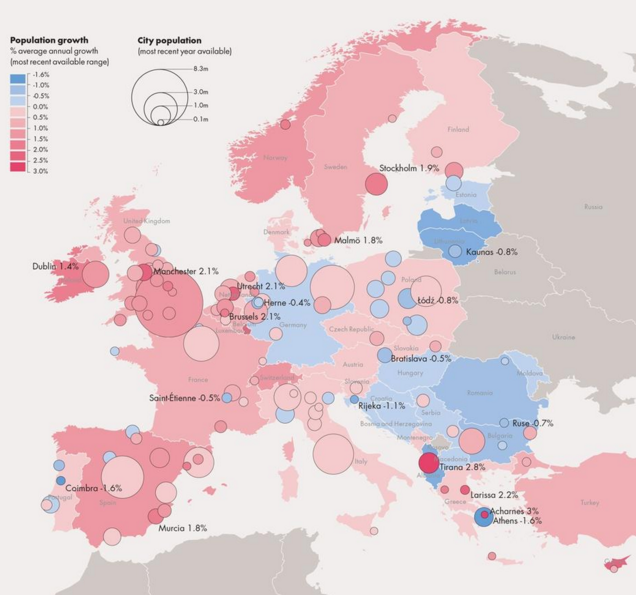 A recent report from Bloomberg Philanthropies and LSE Cities shows how the European continent is constantly changing. Population is shifting to the Northwest, Mediterranean cities are among the fastest growing in terms of population, small towns are getting emptier due to the large urban centers and so on. This visual report is uncovering some very interesting insights. 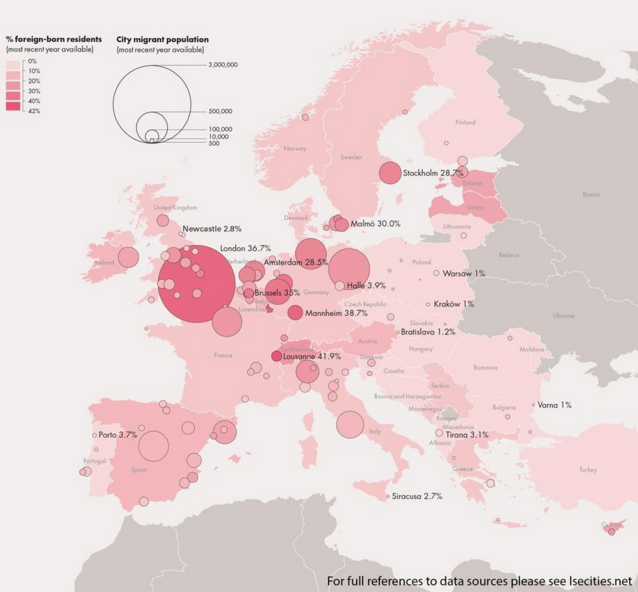 The first map concerns the youth unemployment which is directly linked to moving abroad. We can see a disparity between cities in the same country like Sheffield with a youth unemployment rate of 35% and the near Edinburgh or Cambridge with nearly 0. How this difference can be possible? The worst numbers are those concerning Barcelona, Malaga and Athens where the 2/3 of under-25 year-olds are out of work. Here we see how people are moving to the Northwest Europe, particularly to the English Channel. The Swiss city of Lausanne has the greatest proportion of migrants compared to the rest of the population, but London has the largest total number together with the German city of Mannheim,both are followed by Brussels, Stockholm and Amsterdam. Would you move to the Northwest Europe as well? 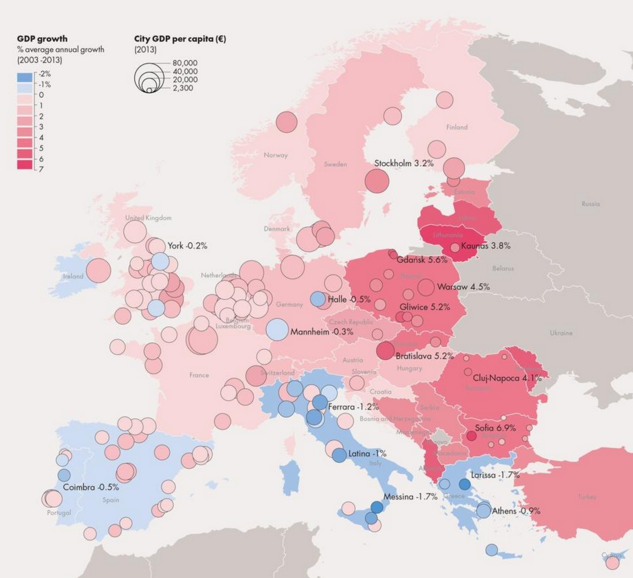 Central and Eastern Europe counties such as Moldova, Lithuania and Poland have the highest GDP growth, while Southern countries keep trying hard to catch up as we can see in the map. Have you experienced moving to once of the mentioned countries? Tell us in the comments below! Are you planning to move? Our expat community on Goguin will make your move easier and cheaper, check it out! See all the posts by Yana Arta at this link.